One man is dead and two others were in the hospital after a head-on collision Tuesday morning in Montgomery County. WASHINGTON — One man is dead and two others were in the hospital after a head-on collision Tuesday morning in Montgomery County. 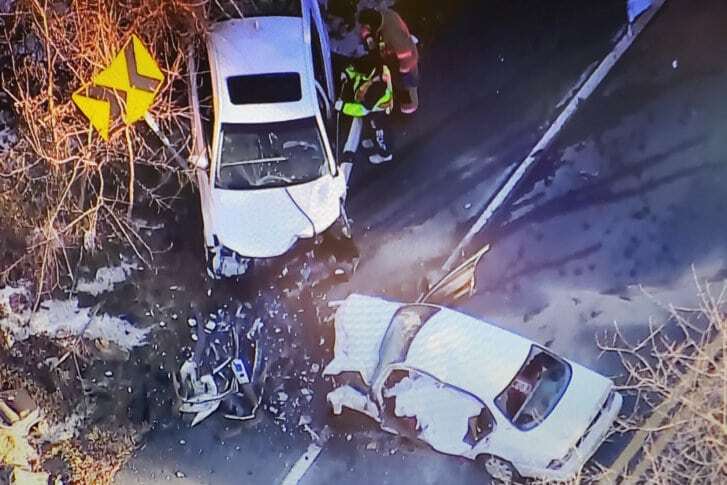 The two-vehicle crash happened before 8 a.m. on Ridge Road, just north of Kemptown Road in Damascus, Maryland, the Montgomery County police said. According to a preliminary investigation, a Toyota Corolla traveling northbound on Ridge collided with a southbound Toyota Avalon. The crash killed the Corolla’s driver, a 32-year-old man who has yet to be identified. The front-seat passenger in the Corolla, an unidentified 24-year-old woman, was being hospitalized in critical condition Tuesday afternoon. Despite life-threatening injuries, she is expected to survive, police said. The Avalon’s driver, 46-year-old Khary Hiram Tolliver of Hagerstown, was hospitalized as well with injuries that weren’t life-threatening. Ridge Road was closed for several hours Tuesday between Kemptown and Mill Bottom Road as police investigated. The road reopened shortly before 12:30 p.m.
Montgomery County police continue to investigate. Anyone with information is asked to call 240-773-6620.